Danish Army Specific: This machine was the replacement for the fleet of Nimbus MC´s. A batch of 400 MC´s were acquired in 1967. Acquisition price was around 5.800 DKr. each. Further machines were ordered in 1969 and in the early 1970´s to a total amount of 1.100 MC´s. The B40 was superseded around 1980 with the introduction of the Yamaha DT250MX. Historical: The B40WD was based on the B40 Star which was produced until 1965. A prototype WD version complete with supports for pannier racks appeared the same year. It also had an easy detachable rear wheel and other features included an fully enclosed rear chain guard and 12 volt electrics to facilitate radio use. With its telescopic front forks was a modern motorcycle in its day and was used for convoy control, messenger services etc. When production of the WD version was terminated in 1971, some 3.000 bikes had been produced. 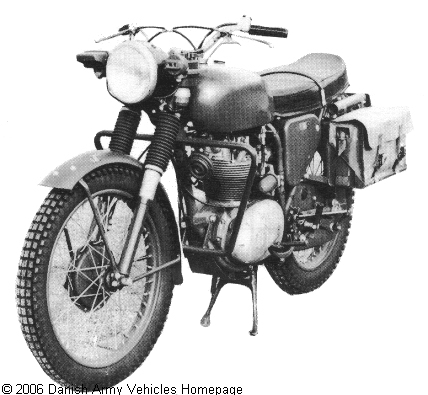 The B40 like most military motorcycles of the period was basically a road machine with limited off road performance. Standard machine of the British Army and RAF until late 1970´s. Length: 2.14 m (83 inches). Width: 0.72 m (28 inches). Height: 1.10 m (43 inches). Weight: 241 kg (532 lb.). Engine: BSA 1-cylinder 343 cm3 (21 cubic inches) displacement, air cooled, carburettor. Horsepower: 18 at 6.000 rpm. Tyres: Front: 3.00 - 20, rear: 3.50 - 18. Fuel capacity: 16 liter (3.5 gallons). Additional: The machines were delivered to the Danish Army through H.V. Hansen (BSA-huset) in Copenhagen.